Oil on canvas. 14" x 18"
​Born in Yonkers, NY, Byron Browne was a central figure in many of the modernist artistic and political groups that flourished during the 1930s in New York City. He was an early member of the Artists' Union, a founding member in 1936 of the American Abstract Artists group, and a participant in the Artists' Congress until 1940, when political infighting prompted Browne and others to form the breakaway Federation of Modern Painters and Sculptors. Browne's artistic training followed traditional lines. From 1925 to 1928, he studied at the National Academy of Design, where in his last year he won the prestigious Third Hallgarten Prize for a still-life composition. Yet before finishing his studies, Browne discovered the newly established Gallery of Living Art. There and through his friends John Graham and Arshile Gorky, he became fascinated with Picasso, Braque, Miro, and other modern masters. Although Browne destroyed his early academic work shortly after leaving the National Academy, he remained steadfast in his commitment to the value of tradition. Increasingly in the 1940s, Browne adopted an energetic, gestural style. In 1950, he joined the faculty of the Art Students League. From 1952-1961, he was active in Provincetown, MA, painting with fellow modernists, Ashile Gorky, Hans Hofmann, and Adolph Gottlieb. In 1959 he began teaching advanced painting at NYU. 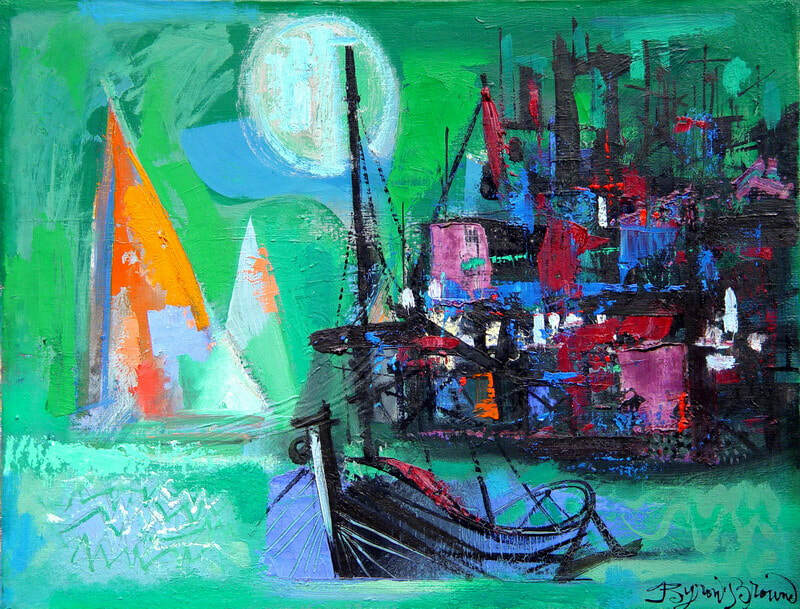 Byron Browne spent the last twelve summers of his life in Provincetown painting harbor scenes, like "Two Boats", in a bold and colorful mix of figural and abstract elements.